He: "Oh look; they have The Grave, The Dead March and the Danse Macabre. "She: "Oh, that sounds ever so nice!" 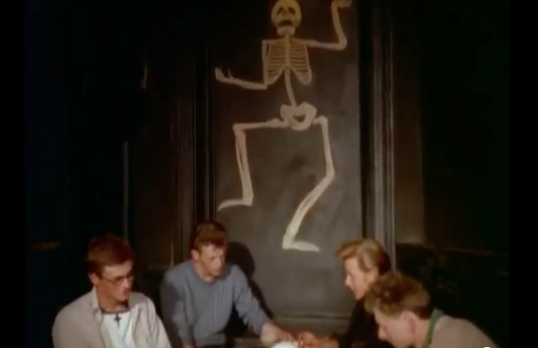 Readers of this blog will already be familiar with one of my favorite historical curiosities, fin de siècle Paris's Cabaret du Néant, or "Tavern of the Dead," which I have reported on here, here and here. 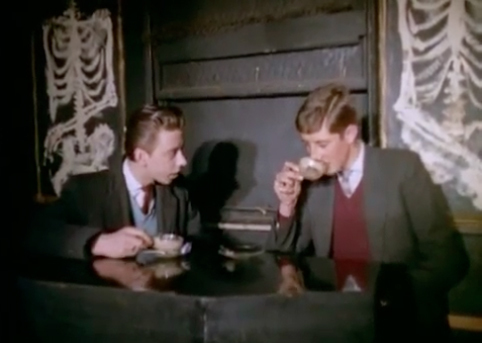 I have just learned about two similarly-themed drinking establishments from days gone by; the first is London's "Cafe le Macabre," as pictured above in images drawn from a late 1950s newsreel documenting the nascent London coffee craze. 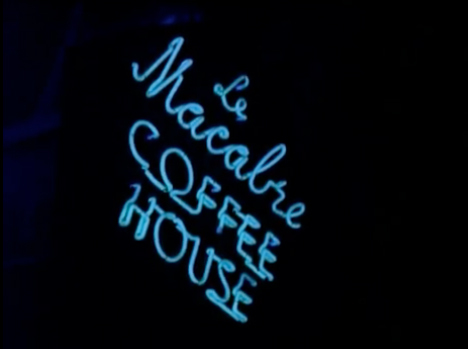 You can watch that newsreel directly above this text block or by clicking here; the segement on "Cafe le Macabre" begins about 7 minutes in. 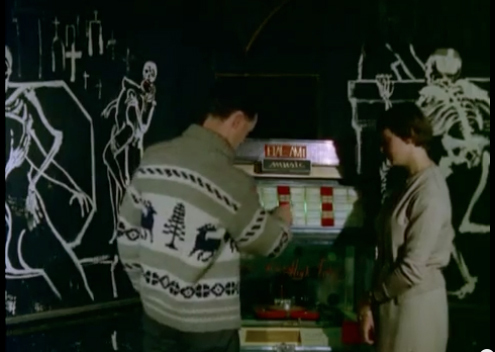 This Soho-based haunt--with Danse Macabre on the jukebox, death and the maiden-inspired murals and skull ashtrays--was featured in Mark Pilkington and Will Fowler's recent Vampires of London talk at the Morbid Anatomy Lecture Series at the Last Tuesday Society. 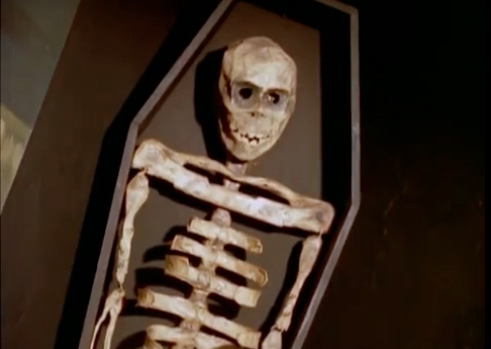 I am happy to report that Mr. Pilkington will be writing a piece on the topic for volume two of the Morbid Anatomy Anthology, so stay tuned for more on that! The Conclave was one of the few concert-saloons to maintain a bar as well as table service, and the arrangement in the back bar aroused much comment--it was fitted up as an exact replica of a section of burial vaults, complete with marble slabs on which were chiseled "Brandy, Whisky, Gin," etc. The bartenders were clad as undertakers, and when one of them served a customer he opened a vault in the back bar and pulled out a small silver-handled coffin filled with bottles of the desired liquor. The Conclave was always very popular among sightseers, but never gained great favor with hard drinkers. Sadly, I was unable to locate any images for "The Conclave;" If anyone knows of any, please send them along to morbidanatomy [at] gmail.com! Also, for those who wish to know still more about the wonderful Cabaret du Néant (and really, who doesn't? ), the heavily illustrated final chapter of the upcoming Morbid Anatomy Anthology--“Hell Époque: Death-Themed Cabarets and other Macabre Entertainments of Nineteenth Century Paris" by Vadim Kosmos--is for you. You can still order a copy of the book by hitting the black "pre-order" button on the upper right of this blog. Also, for the California-based among you, you will have an opportunity to learn yet more--and sample cocktails made from original Cabaret du Néant recipes (!!!) --under the tutelage of the incomparable Mel Gordon at the Morbid Anatomy segment of LA Death Salon this October 19th. Hope very much to see you there!